I don’t blog as often on the out and out geeky side of things here very often right now but I wanted to share a project that I’ve been working on. Along with all of the Buddhist things that I do, I am a founding member of a hackerspace and spend a significant amount of time each week with hackers hacking (along with my job working on the Firefox web browser). 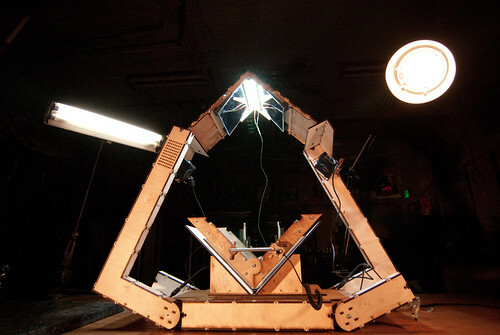 Yesterday, I went over to Ace Monster Toys, my local hackerspace here in Oakland, to work on a DIY Book Scanner. Daniel Reetz came up with this idea a while back for cheaply and easily scanning in books into computers without cracking the spine on his books. A lot of people have taken it and run with it, spawning improvements, since Daniel’s original book scanner. This technology is very similar to what Google used for their giant bookscanning project with various universities except done on the cheap. It consists of a simple rig, normally made out of wood. 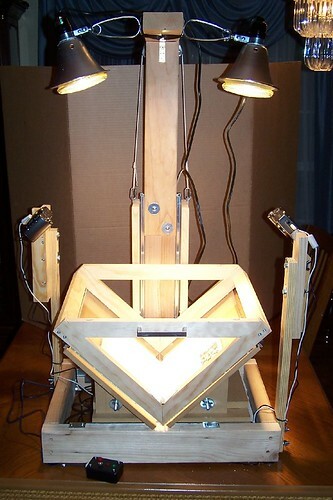 It has a cradle to support the book, open and face up, a platen made of glass or acrylic to hold the pages flat, a lower end digital camera focused at each page, and lighting. This is connected to a computer to process the images as they come in. Wired’s Gadget Lab wrote a blog post about it a bit over a year ago. Myles, whom I know from AMT, and I decided that we wanted to work on one of these. I had suggested it as a project but hadn’t gotten around to trying to implement it. Myles jumped on grabbing some appropriate cameras (Canon 480s) and we arranged to get together to work on it yesterday. Yesterday, we went to home depot, bought a bunch of parts and began working on the base. This is a square frame with a pair of drawer rails mounted inside. A platform is mounted on these rails and then the cradle to hold the book sits on it. The important parts, other than making it relatively even, is that the rails need to allow the cradle to slide back and forth in order to center different sized books under the platen and camera. The cradle needs to be adjustable on this platform to accommodate the spine and pages of both large and small books as well. The cradle needs to be angled at a right angle in total so the pages of the books will directly face the cameras above. While we were working on it, Stefan from AMT (who does have some wood working skills) was around and wound up getting sucked into helping us. After five hours of work, we managed to get the based entirely put together with the exception of mounting the last two pieces of the cradle where you place the book. We’re going to get together later in the week to continue the work. Myles has put together a linux virtual machine that contains the software to process the scanned images. He’s also doing more electronics work. 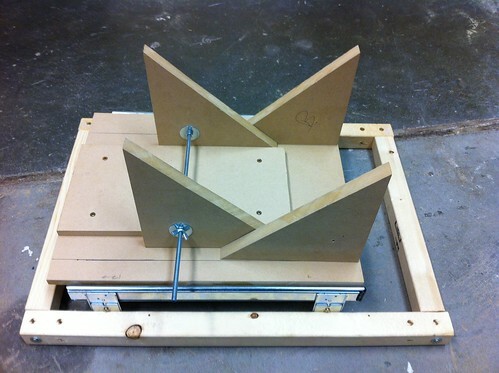 The tricky part will be the platen because it requires a lot more detail work to have it function correctly. Once that is put together, we just need to mount the lights and cameras and start tweaking the whole thing.